I'm not sure how I never noticed this before, but did you know there is a Phish Food froyo? It's been almost a year and a half since I tried light Phish food so I can't compare taste for taste, but thankfully I can read what I wrote. 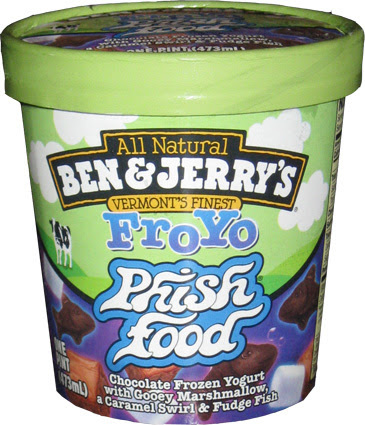 Ben & Jerry's Phish Food Froyo is Chocolate Frozen Yogurt with (ooey) Gooey Marshmallow, a Caramel Swirl & Fudge Fish. Here we are up close and personal with some very happy fish (look at the top one, though it is hard to see... DOH! I forgot to do the penny test!). You can kind see the glistening caramel streaks in the top half of the picture plus you can also see the puddles of marshmallow. I dig in WOW is this stuff strong, like crazy strong. I'm not sure whether to explode or implode at the moment. The chocolate is strong, the marshmallow is rampant and the phish, well, they're pretty tasty! This is just such a potent flavor! I don't even remember the last time my taste buds had a beat down like this. Ok, so flip back to the light Phish food review and notice I said there was something off about this ice cream. Well, I've matured since then and I don't think off is the right statement. Potent is a good word, and I'm trying to think of another way to say it. I can totally see people enjoying this, but I can see alot of people using the phrase "sickenly sweet" --- need proof? There is a whopping 27 grams of sugar per serving! That may be a blog record! Whoa whoa whoa, stop the presses! Phish Food Froyo isn't even on the company website (though the container obviously doesn't say new on it). Hmmm, I just did a quick search and not much popped up except a few people trying it over this past summer. Hmmm, curious. Recap: Chocolate Strong. Marshmallow everywhere (very fluffy and gooey). Phish are good and plentiful. They've got a unique taste to them, and a bit of a crunch/thud to them. I want to say gritty, but I don't want to give you the wrong idea. It's not just a smooth chocolate, something else is going on (unless it's the caramel messing with my taste buds). On Second Scoop: Ok, a thought ran across my mind... well, technically two. You see, I was hungry and I'm still going to be up for another 3-4 hours, so now is the perfect time for a sugar shock. I went mentally preparing to try Phish Food again when two familiar tastes/thoughts ran across my brain. I dug in and sure enough I think I'm right. First off, like light Phish Food, there is definitely a chocolate covered marshmallow candy vibe going on here. Second, this flavor also reminds me of the most excellent Haagen-Dazs Rocky Road. The difference is that the H-D marshmallow is kept in checked, here it's running rampant! I love this stuff. It is incredibly sweet but I can't get enough of the marshmallow swirl. i'm in the same boat as rod. 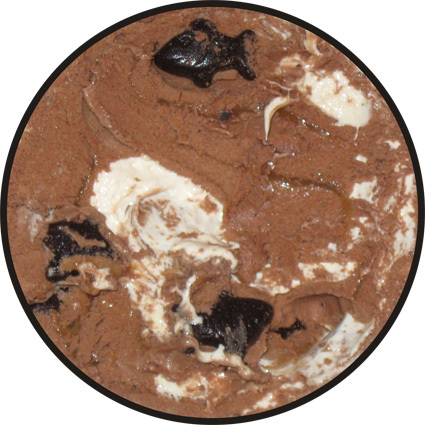 the fact that the chocolate flavor is so strong, there are so many fish, and the marshmallow swirl is so ridiculously prevalent all make this ice cream awesome. the fact that there's no info about this flavor on the b&j website scares me. if i get even the slightest hint that it's a limited edition, i'm buying out every one i can find in every store near me to stock up.